Have you ever seen a vehicle that has corrosion on only one panel? Do you then wonder why just one panel has corroded while the same panel on the opposite side of the vehicle is pristine and corrosion-free? Collision damage repair can create “hot spots” for corrosion to start and accelerate at a pace faster than the rest of the vehicle. This is further influenced by environmental conditions and if proper steps are not taken to protect repairs, the resulting failure may appear quickly, or years down the road. More and more attention is being paid to corrosion prevention following a repair. This has led to a more sophisticated approach to restoring OEM standards when a repair is made. At 3M Automotive Aftermarket Division, we have identified the core four solutions to achieve the proper corrosion protection: cavity wax, seam sealants, coatings and paint systems. One process that is impossible to repeat in a repair facility is that of electrodeposition coating, known as e-coating. This process is performed on the car body just after it has been welded and bolt-on closure panels are attached — basically, a bare metal body. The process itself is quite extensive and involves several cleaning, rinsing and preparatory baths that completely submerge the car body. Finally the body is submerged in a primer designated by the manufacturer’s paint supplier. Automotive manufacturers have largely adopted similar processes to protect car bodies for many years of service in harsh environments; vehicles thereby maintain their beauty and value, but even more importantly, their safety, as key structural components are benefiting from this protection. Enter the collision repair when e-coat has been compromised or parts have been replaced. Parts that have lost the protection of factory e-coat require restoration in the affected area. In fact, many automotive manufacturers recommend the use of sealants and internal or external corrosion resistant coatings on new bolt on replacement parts such as doors, hoods, deck lids and lift- or tailgates, even when these materials may have not been present on the original part. We will address the importance of these sealants and coatings in the repair process and offer the workings of a complete corrosion protection solution in relationship to internal and foundational materials. Additional materials provided by paint manufacturers make up the balance of a complete corrosion protection package (approved primers, base coat and clearcoat). Grinding and welding of steel pose the perfect storm when it comes to exposing steel to oxidation (rust). Most often, the external surface will be finished to match the surrounding body parts however the internal portion remains exposed and is subject to rust propagation. Internal corrosion protection known in the industry as “Cavity Wax” serves to seal and protect this area. This type of product is low in viscosity and is applied using a long flexible tube equipped with a 360-degree spray nozzle to effectively coat closed cavities. Such coatings are designed to remain in a “tacky” undried state indefinitely, not “flake off” the surface of a weld or panel, and will creep into even the tightest recesses when multiple coats are applied. This technology is almost universally called out by automotive manufacturers for weld-on and collision-damaged panels. A little known fact is that the same manufacturers recommend this type of material for new bolt-on replacement parts as well. This extra step serves as aftermarket repair protection supplementing the e-coat bath process mentioned above, extending the life of the replacement part. Seam sealants serve the purpose of preventing intrusion of water between joined panels and, in turn, the prevention of corrosion formation. Many original equipment suppliers rely on liquid-applied polyvinyl chloride to fulfill the requirements of caulk- and spray-grade sealant. These products require a high-temperature curing process, making this type of technology unfeasible for the automotive aftermarket. Single component moisture curing chemistries provide the most reliable and cost-effective method for sealing automotive interior and exterior seams; however, two-component epoxy and urethane formulas serve a large role in the repair industry due to the productivity improvement shops can enjoy through their more predictable dry times. Sealants are typically applied to the outer portion of the seam; however, whenever possible, sealing both sides of the seam provides the best protection. Some sealants provide adequate corrosion protection even when they are applied to bare metal. Other sealants require the application of high-quality 2K or epoxy primer first – more on this later. Many manufacturers recommend the sealing of hem flange joints located on replacement doors, hoods, deck lids and lift or tail gates even when the original part did not have a sealer present. This extra step (combined with cavity wax) serves as the aftermarket repair option that provides the best corrosion protection in place of the e-coat bath process mentioned above, further extending the life of the replacement part. Coatings serve the purpose of further enhancing corrosion protection. This includes under-coatings, sprayed seam sealers and gravel guard or chip protective coatings. Again, this technology at the automotive manufacturing level is most often polyvinyl chloride and requires high-temperature curing cycles making this type of technology unfeasible for the automotive aftermarket. Aftermarket solutions for coatings may be solvent- or water-based chemistry; however, some two-part urethane and epoxy options also exist. After installation, parts may often differ from the original appearance of coating/sealing configuration including floor pans or underbody/structural parts. Repair facilities should be aware that many OEMs suggest that these repaired or replaced parts require the application of a protective undercoating to improve the corrosion resistance of the replacement part, even though the original part did not appear this way. Automotive manufacturers are quite aware that the process used in the aftermarket cannot precisely replicate the original manufacturing process and recommend alternative materials and procedures to prevent corrosion formation. The fourth and final group of products that complete the corrosion protection package are the materials provided by paint manufacturers (approved primers, base coat and clearcoat). While paint preference varies by shop and paint professional, the step-by-step layers are critical in keeping out the elements that can lead to corrosion after a repair. The paint materials are integral to the complete process, especially a high-quality primer as mentioned above; base and clear may or may not be applied in all areas of all the repairs as interior and under hood appearance may differ by manufacturer. Suffice it to say global paint manufacturers invest significantly in the development of products that can with stand the environmental conditions that cause corrosion, they offer complete paint solutions that should be followed and not intermixed with off-brand elements. In summary, you can see that corrosion prevention garners serious attention at the automotive manufacturing level, and today’s vehicles are a testimony to this as they maintain their beauty and safety for many years. Products and process steps have been created to restore the protection originally built in by the manufacturer, and following the manufacturer’s repair guidelines, implementing best practices and just being conscientious about corrosion protection can provide longevity and safety to your repair. 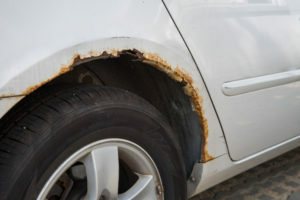 Visit www.3MCollision.com for SOPs about corrosion prevention on your repairs. Protect your customer’s investment and keep them safe by preventing corrosion on every repair when the potential for corrosion is present. Dennis R. Keicher is the technical service application specialist for 3M Automotive Aftermarket Division. 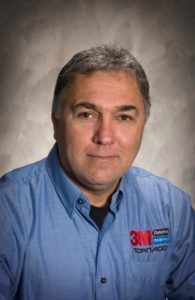 Current assignments with 3M include project management and technical leadership in new product development of corrosion-resistant coatings and seam sealer technology.